Between early May and late July/early August (weather permitting) Gordon Grant Marine make daily trips to Lunga from Fionnphort (except Saturdays). Times vary, leaving Fionnphort Sunday & Monday about 1210, Tuesday-Friday 09:50. Two hours ashore on Lunga, followed by an hour ashore on Staffa. Total duration about 5½ hours. In high season it is best to book at least the day before, which we will be pleased to do for you. The puffins and other nesting birds leave their nests and go back to sea around the end of July, and there are no further trips after that. The boat leaves from Iona and calls at Fionnphort before departing for Lunga, so you can go to Iona in the morning, take the trip to Lunga and return to Fionnphort, or vice versa. You can also make a similar trip with Turus Mara from Ulva Ferry (at least 1½ hours drive from Maolbhuidhe). Puffins are a great favourite with visitors because of their brightly coloured beaks and clownish appearance. They spend most of the year at sea, returning to land from April to July to breed, and going away again in early August. They arrive offshore in March/April, gathering in 'rafts' on the sea, and then gradually come ashore to start nesting. They nest in burrows at the top of the cliffs, and will use the same burrow year after year. A single egg is laid, and hatched in May/June. The parents both care for the chick, and can be seen bringing sand eels in their beaks. In early August the parents leave the nest and the chick follows after a few days, usually at night. The puffins gather on the sea again before flying away. 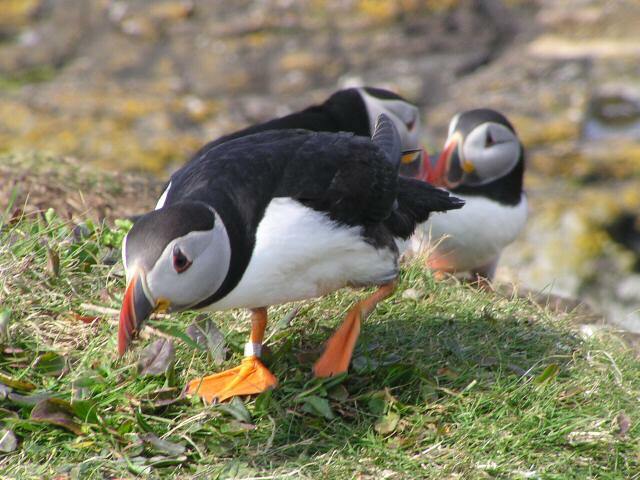 The puffins on Lunga are unafraid of people, and it is easy to creep to within a few feet of the nest openings. An ideal opportunity for photography. Please do not walk over the burrows. Many people are surprised to discover that the puffin is only about the size of a pigeon. 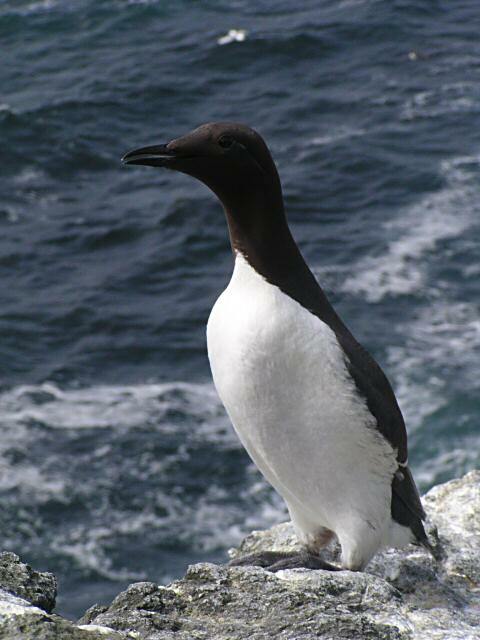 Other birds nesting on Lunga include Kittiwakes, Guillemots, Razorbills and Shags. 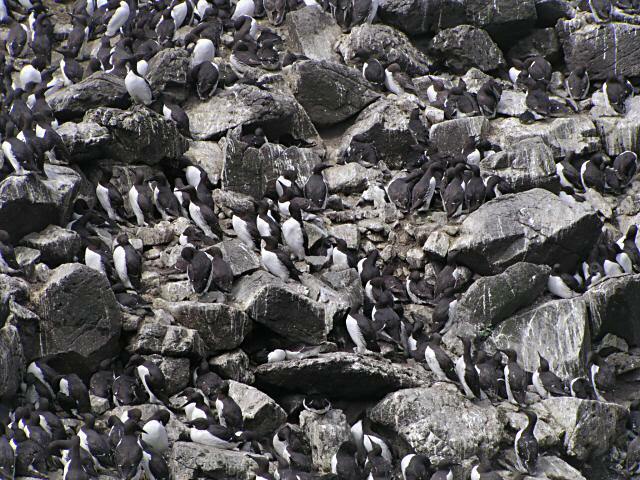 The latter tend to nest under cover in small caves or crevices beneath rocks, but the others gather in huge colonies on the sea stack on Lunga's west side. The noise (and smell) is considerable, but well worth the half mile walk from the landing place. Do this first, and then go back to the puffins.